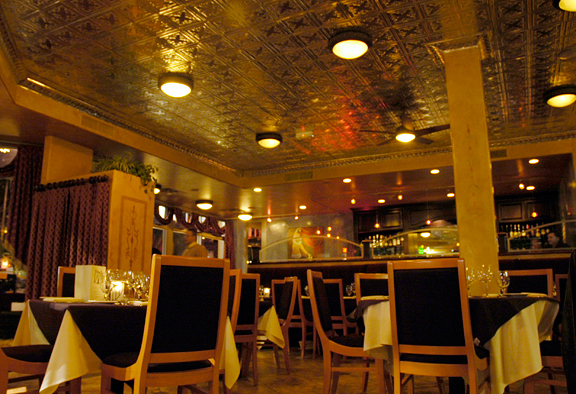 L’Absinthe sits on the corner of Broadway and Walnut – spitting distance from Pearl Street. Upon entering, the ambiance is cozy, intimate, secluded. Patrons entered in attire from suits to jeans and it was all casual and elegant at once. There is a full bar, an exhaustive and fine wine list, and live piano courtesy of the restaurant manager. The French menu offers a healthy dose of seafood and raw shellfish alongside classics like duck confit and steak au poivre. We found our waiter (the head waiter) to have impeccable timing. We never waited for anything, we were never interrupted. The manager offered us complimentary port with our dessert, and the head waiter gave us two cards for complimentary appetizers with any entrée for our next visit. I was in a soup mood and opted for the onion gratinée ($7). It was served in a small crock topped with two garlic croutons and melted gruyère. The first bites were very satisfying. 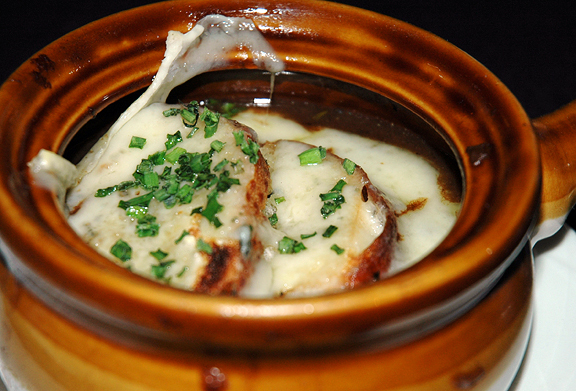 The gruyère had a sweet and nutty flavor to compliment the garlic on the croutons. I found the soup to be heavy on the onions, which were also very sweet, and wanting in the amount of broth. It was almost stew-like. Although I love onions, this was just a bit much for me. Personal preference. Jeremy ordered the lobster and crayfish bisque ($9). I think he had lobster on the brain. 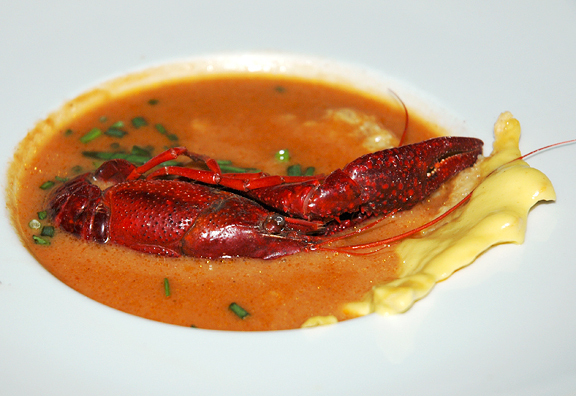 This soup was served with a whole, steamed, bright-red crawdad in the bowl, and a Parmesan tuille to the side. Jeremy felt that the tuille was not necessarily complimentary to the flavor of the bisque. He also noted that the crawdad was not as tender or sweet as others he has had. However, the bisque itself was a perfect balance of richness without heaviness, conveying the flavors of the seafood nicely. Jeremy left the menu for one of the evening’s specials: Surf and Turf ($36) which was half of a lobster and filet mignon, which he ordered rare. We are both of the mindset that cooking beef beyond medium rare is by all accounts, a travesty. His very full plate came with a dark and heavy sauce on the lobster half, a bed of potatoes au gratin (with some member of the blue cheese family) upon which the filet was set and topped with wild mushrooms, creamy saffron risotto, spring vegetables, and a beaujolais truffle (?) reduction sauce – all topped with a bouquet of mâché (lamb’s lettuce). He felt the lobster was not particularly tender or sweet and discovered a lot of grit in the tail. 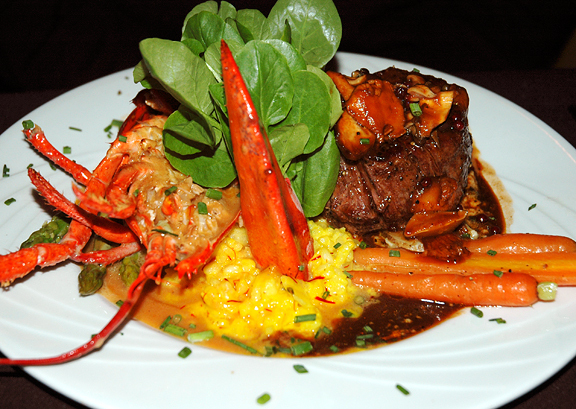 The sauce on the lobster was probably heavy so it wouldn’t be overshadowed by the beef, which Jeremy said was excellent. He said the risotto was too creamy, but I thought it was heavenly. He was all about the mâché, the truffle reduction sauce, and the potatoes. 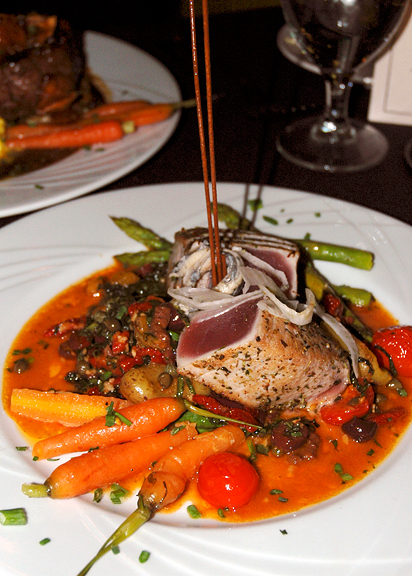 My entrée was the seared ahi tuna ($27) which was plated on a bed of baby spinach mixed with baby carrots, asparagus, cherry tomatoes, and fingerling potatoes in a niçoise sauce dotted with bits of tangy olives and sun-dried tomatoes. Two pieces of deep pink ahi tuna, seared just on the outer quarter inch, were adorned with shavings of what I believe were sunchokes (jerusalem artichokes) and an anchovy. I think the anchovy was a bit overpowering, but the herbs on the tuna, and the ahi itself were delicious. In general, I think I prefer the Asian or Hawaiian influenced flavors of serving ahi tuna, but this excellent tuna was not wasted. I think the combination of the tuna with the spectrum of fresh garden flavors in the vegetables and the sauce was the big winner. As a whole, this plate was deeply satisfying without being overbearing. It is just what I wanted that night. 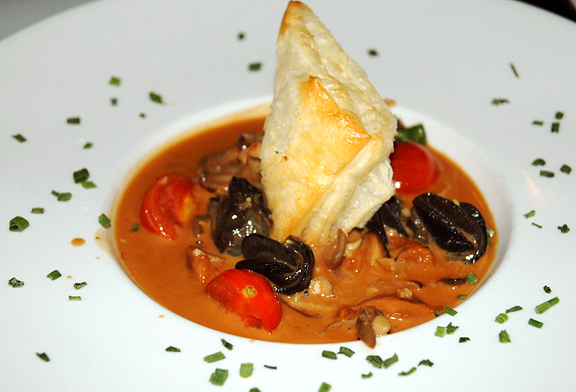 We weren’t actually fool enough to stuff ourselves on appetizers, soups, and entrées this time! We did not finish our plates and asked for the remainder to be packed for us while we pondered the dessert menu. 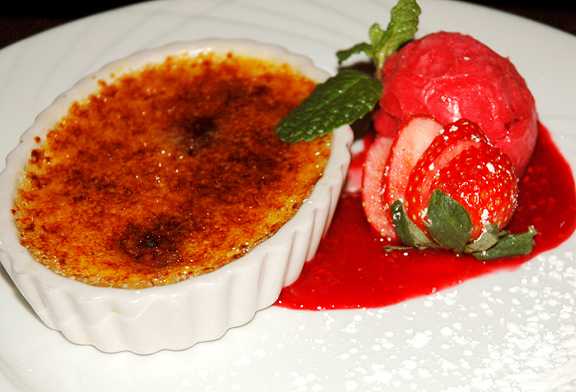 There was no decision to be made for me – it was the crème brûlée ($8) all the way. The tiny ramekin was served next to a scoop of raspberry sorbet, adorned with a mint sprig and a sliced strawberry, sitting in a pool of raspberry coulis. The custard was super creamy and delicate in vanilla flavor (with real vanilla bean) and two raspberries lay in surprise beneath the golden caramelized burnt sugar topping. I loved the combined textures of the smooth custard and the crunchy sweet caramel – especially with a touch of the coulis. Puzzling over whether to get the pyramid chocolate mousse or the chocolate fondant, Jeremy opted for the chocolate fondant (Flourless Chocolate Cake: $8). I think this was a most fortuitous choice because the manager of the restaurant sent a complimentary glass of port to our table (well, he offered two, but Jeremy was having a cappuccino). The cake was dense, rich, and perfectly smooth. It paired so nicely with the port. Jeremy mentioned that his cappuccino was just the way he likes it: HOT. 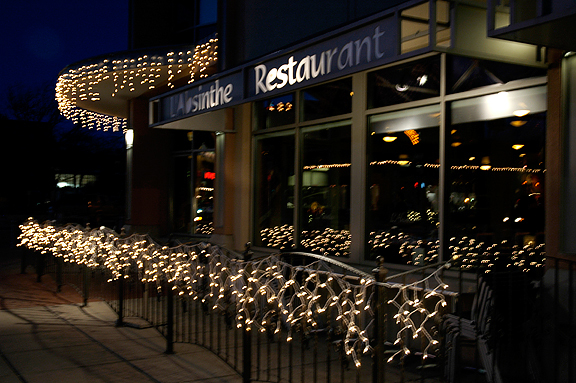 L’Absinthe is mostly hits with a few misses. 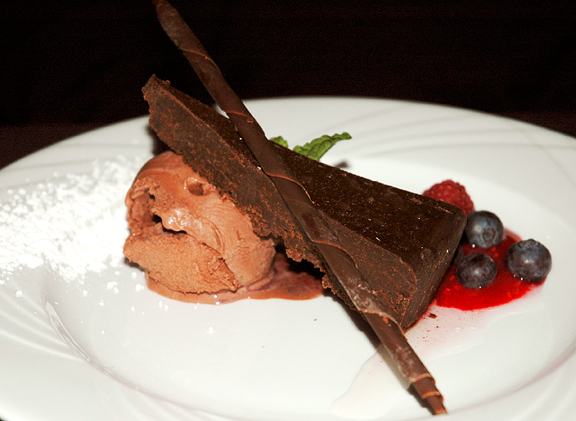 We really enjoyed the fusion of flavors and the treatment of the various dishes. The ingredients are fresh and the quality overall is good. Note: We have since been back to L’Absinthe with Jeremy’s parents and again, the lobster was disappointing. I got the bouillabaisse and felt very lukewarm about it. On the flip side, their oysters and land animal dishes were quite good.